As Cincinnati gets ready to hosts its first All-Star Game since 1988 on Tuesday, it is hoping the Home Run Derby doesn't suffer the same fate as that year. As Cincinnati gets ready to hosts its first All-Star Game since 1988 on Tuesday, it is hoping Monday night's Home Run Derby doesn't suffer the same fate as that year's competition. The 1988 Home Run Derby was canceled due to rain, the only time in the event's 30-year history that the Derby has been canceled. That year's Derby was going to be held at Riverfront Stadium, the old home of the Reds that was later renamed Cinergy Field. The All-Star Game scheduled for the next night went on as planned at Riverfront. As the Home Run Derby returns to Cincinnati at Great American Ballpark on Monday, rain once again threatens the event. As of noon ET on Monday, The Weather Channel predicts an 80% chance of strong thunderstorms at the Derby's scheduled start time of 8 p.m. ET, with chances of scattered strong thunderstorms in the hours after. 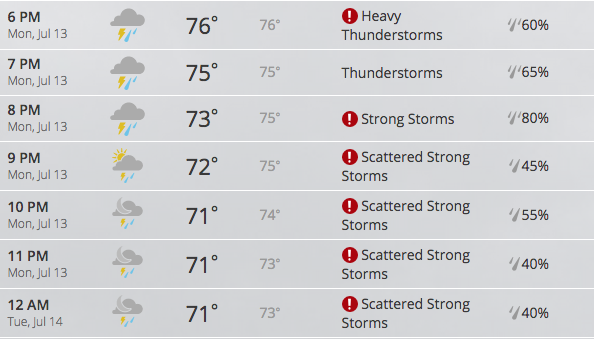 The Weather Channel predicts a 50% chance of scattered thunderstorms on Tuesday night in Cincinnati. The All-Star Game is scheduled to begin at 7 p.m. ET on Tuesday. 2015 Home Run Derby participants and format can be found here.